This book explains to the hillwalker, in easy to understand but accurate terms, how geology has shaped the landscape of Snowdonia. A selection of thirteen guided walks are used to illustrate this in terms of what can be seen on the ground. Divided into two parts, it is intended to help those who love Snowdonia’s mountain scenery to understand how this haunting landscape came about. The first half narrates the story of colliding continents, volcanoes, mountain-building and glaciation in creating Snowdonia, explaining why volcanoes occurred, the rocks they created and how to interpret signs of mountain-building and glaciation on the ground. The second half describes several recommended walks, of differing levels of difficulty, but all with a wide variety of geological features to be seen and, most important, enjoying consistently fantastic views of the very best of Snowdonia’s wonderful scenery. This was an unexpected and welcome birthday present. I had briefly clocked this on the shelf in the shop but had insufficient time to pick it up and flick through. I have this feeling I must have bumped into Paul Gannon as he trekked around the Snowdonia massif – his face looks too familiar. Delving into this reminded me of my time on the Outdoor Education Course at Plas Y Brenin as Tim Jepson tried to inculcate the intricacies of the Idwal volcanic flows and of the Carnedd Y Filiast slabs being created. I tried and sometimes grasped the concepts – how I wish this book existed then. 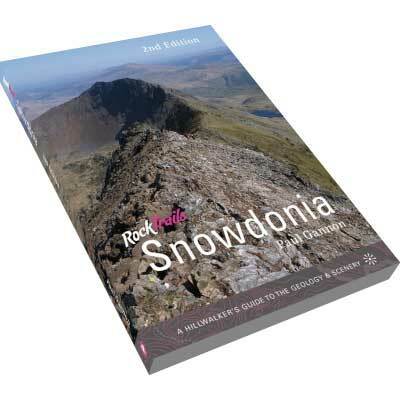 This book has value for the Instructor and hillwalker – it explains how the geology of Snowdonia has shaped the mountains and vistas we travel through and climb on. The first half explains the science, whilst the second half demonstrates and amply illustrates the science, by offering thirteen walks for us to travel through the landscape and highlights on the ground what is there to be seen. We often look to television to illustrate and explain the geology of volcanoes, continental drift, glaciation and how the world has changed to the one we now see around us. No more. This book reminds us of the beauty and savagery of one corner of the British Isles and how it came to be. The science and the walks come together to explain the process of building the mountains in which we walk and climb. I have enjoyed the walk I have done already and look forward to further building my knowledge by walking the other routes with book and camera in hand to capture the views when they eventually appear from the summer deluge! This is a timely piece and one that has much to commend – it is an enjoyable read as well as a valuable field source.